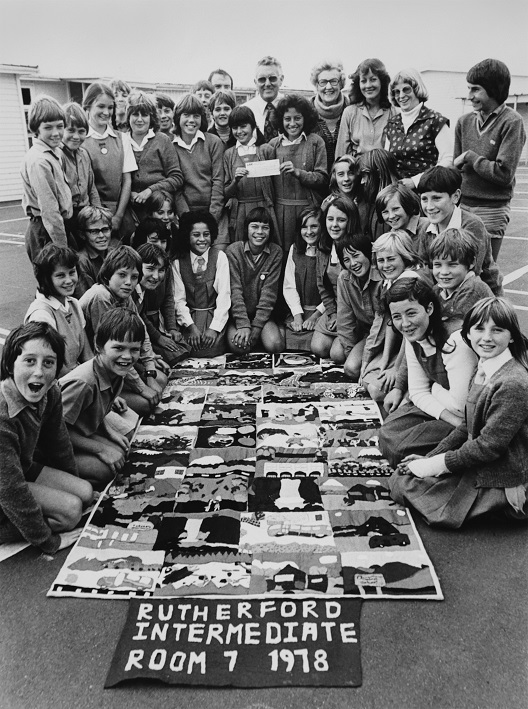 Left: Wanganui Chronicle photograph of the 1978 Rutherford Intermediate Room 7 class with Rutherford Principal David Dale, Councillor Phyllis Brown, Arts Advisor Rei Hendry and Teacher Dawn Duncum. Courtesy of the Wanganui Chronicle. Right: Rutherford Intermediate School Room 7 Wall Hanging commemorating a picnic at Mangatepopo Camp School, 1978, mixed media – felt & cotton, Collection of the Sarjeant Gallery Te Whare o Rehua Whanganui. Purchased 1979. “I remember that!” The enthusiasm is palpable as two Whanganui educators (Dawn Duncum and Rei Hendry) and a former pupil of Rutherford Intermediate School (Jennifer Taylor Moore, Curator of Collections, Sarjeant Gallery Te Whare o Rehua Whanganui) reminisce over a joyous felt work that hangs in the Gallery’s latest exhibition Revealed: Collection discoveries from our recent move on display until 18th September. Colourful trout leap after flies, snow-capped mountains (Tongariro and Ngauruhoe) pierce blue skies; kids ride in buses, tramp through bush and volcanic terrain; someone collapses smiling, exhausted on a bench. 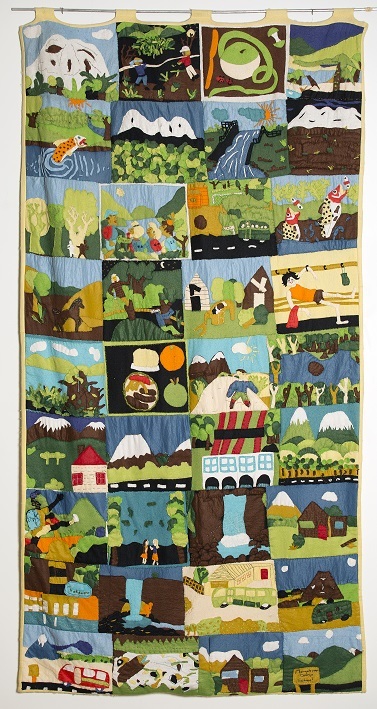 A class of 36 children made the felt wall hanging in 1978 after visiting Mangatepopo Camp in Tongariro National Park. So if you were a pupil at Rutherford Intermediate School in 1978 or remember working on one of these projects the Sarjeant Gallery would love to hear your memories.